It is very important for us to make ourselves known and explain what our philosophy is. The TrikeGo with its characteristics was fruit of the collaboration between specific professionalism and sensibility. Had we been only interested in getting into the cargo bike sale market, we could have imported the bikes, as others do. But studying a little the history and the tradition of cyclomobility in Italy we have come to realize that there was a great cultural heredity we could use. In the 20’s and 50’s in Italy most of the goods was transported by tricycle. Why, then, not to RE-evolve it? So, with due respect for companies in North Europe, America and Asia, that have established themselves in the market in the last 20 years, we thought it would be more suitable and profitable, also in consideration of the serious financial crisis we are going through, to involve local craftsmen and professionals who, with their skill and patience, have developed our beloved TrikeGo. In our smith’s workshop the drawings begin to get shape, to materialize: from a sheet of paper they move to the workbench, up to the final test of the idea. It is here that the various solutions are tested, in order to define at what will be the prototype of the series. Attention is paid to the materials, precision in carrying out the frame template and great experience in the series production, keeping the craftsman philosophy of the product. The quality of our frames makes the difference. We trust the skill of the craftsmen, who, thanks to their knowledge of wood, know how to treat it in order to get the best result as far as. The painting of our frames has a great importance in the production process. The particular procedure adopted ensures constant quality over time. The assembly is performed by mechanical TrikeGo professional cyclists with long experience in the treatment of handmade bicycles. Each vehicle is inspected and tested in every part until the final testing on the road. Rain proof and sunshade equipment are proudly made by BagMi, an excellent local small business involved into reuse of freight lorry covers, promotional banners, inner tubes, bike tyres and coffee or potato bags. We believe that the entirely Italian manufacturing is a very important surplus value, both for inner and foreign markets. We really have TrikeGo in high consideration. Many kinds of professional profiles actively contribute to develop our brand awareness, not just master craftsmen but graphic designer and IT and SEO/Marketing specialists working on the website as well. Last but not least, TrikeGo is an artisanal creature which brings out a very strong human part in itself. 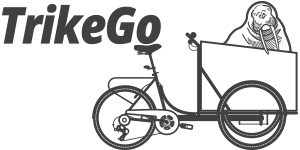 TrikeGo is a mean of transportation which gives smiles to riders, passengers and surrounding people on the street. TrikeGo is a mean of carrying that rise from the ranks gently and wisely.